After a few weeks of being home alone, it was time to return to South Africa and rejoin my wife and children. As explained before, cost was the ultimate deciding factor, and I was pleasantly surprised that the cheapest routing turned out to be quite interesting as well. 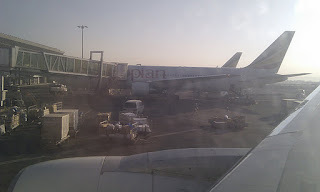 Due to lower air taxes, I had looked at departing from Italy, Belgium or Spain, and in the end Italy won out, with a route of Milan Linate to Frankfurt on LH, transferring to Ethiopian's flight to Addis Abeba and on to Johannesburg. I then had to book a flight to Italy. 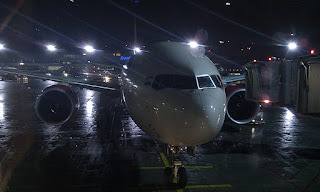 I originally booked Germanwings STN-CGN-BLQ, however I later received an email saying that the CGN-BLQ leg on the day I was due to fly was cancelled, and I could re-book for a different day or get a refund. I phoned the helpdesk to ask if I could re-route to MXP, but this was not allowed, so I opted for a refund and set again looking for a cheap route to northern Italy. The best deal popped up with BA, LGW-TRN, which was around £20 cheaper than the 4U flight, and the train to Milan was only €10 from Turin. Come the day to depart, I went to work on the bus instead of driving, as I would be leaving straight from the office. That evening I took the train into Cambridge, and checked into the Travelodge that I had booked during a £10 sale, as I was going to have an early flight from STN and it is conveniant for Cambridge station. In the end I could sleep in a bit longer, and arrived at the station in time for the morning rush of incoming commuters - not easy with a huge pack on my back and a smaller rucksack on my front! I bought a ticket for Gatwick from the ticket machine, only £20 if you opt for the Liverpool St line and the Southern stopping service to Gatwick. I approached the checkin area for the first time, and an agent hovering near the machines directed me to it. I explained that I'd used the smartphone app to check in already, so the barcode on my phone was scanned, and a baggage tag printed for by pack. I had to take it to the oversize luggage area, even though it was "only" 19kg, and mostly filled with Christmas presents! Security was a breeze, so I then looked for the No 1 Lounge, which I had pre-booked online with a discount code (PM if you'd like it, valid at most UK airports, though I'm not sure of the expiry date). I had about 3 hours before departure, so I settled in at a seat by the window to watch the traffic. 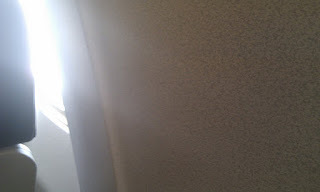 The sun was quite bright, and it was very warm inside, but it was very relaxing. I had a look around the lounge. There was also a bar area, a snooker room, business room, children's room (just a big TV, bean bags to sit on and painted walls - shame there were no toys) and an adjacent, payable spa. I ordered Eggs Benedict from the bar - you are entitled to one hot option as well as the buffet, but decided to stick with non-alcoholic drinks for the moment, as I'd be trying to navigate my way around two Italian cities later. I also had some salad, pastries and cakes, some tea, Coke and juice. 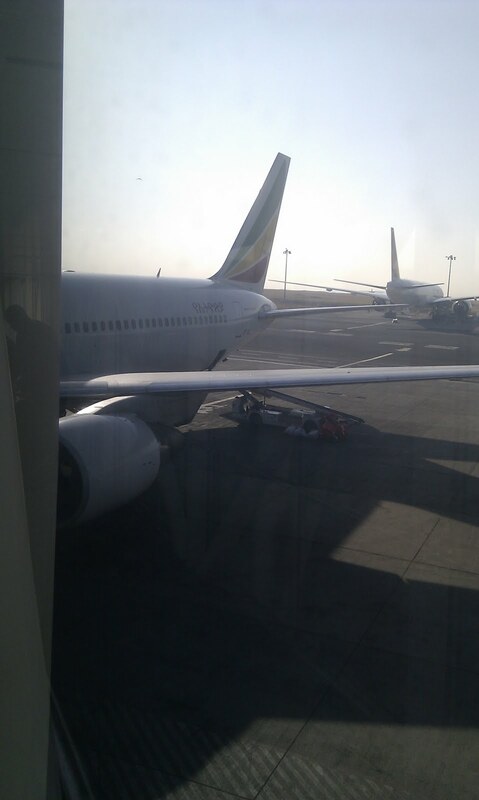 It was soon time to leave and find my way to the gate. Unfortunately I didn't get to cross the famous bridge, instead I wend down one of the curved ramps in the middle of the shops to find my gate. Boarding commenced and we headed down the bridge to the old 737. 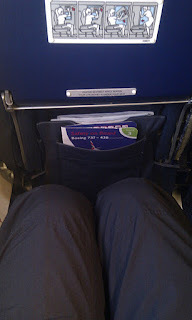 I had selected an exit row seat so I had plenty of room. The load was very full, perhaps aided by the low prices for the flight, even Club appeared full. It seems that quite a few people had taken advantage of the offer to upgrade for £59, though I don't think it was worth it, unless you had lots of luggage - legroom appeared to be almost the same, and the No 1 lounge pay-per-entry was a lot cheaper than that (£17 with the code). We took off and almost immediately were taken in by the clouds, to be spat out in sunsine, but with no view to the ground. The bar service started, so I had a beer (only Heineken, sorry Suryo!). I was disappointed with the snack - the brand name was Cranberry, but it was only nuts and raisins, no cranberries! It began to get dark, and was pitch by the time we arrived in Turin. 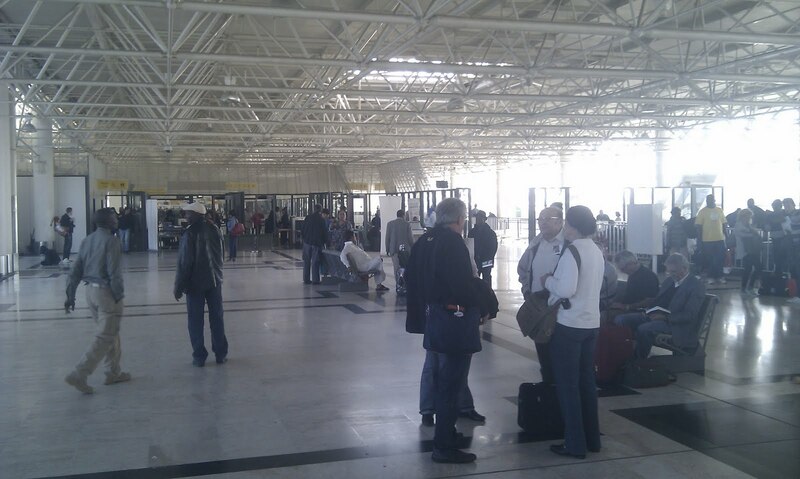 Passport control was quick and cursory, and luggage was quick to arrive. I then made my way to the station. It must be said that Turin has a poor transport connection to the airport. Firstly, I tried to buy a ticket from the machine, but none of my coins was accepted. Fortunately someone saw me and said I could buy one from the tobacco kiosk in arrivals, which I did. Then I took the train into the city. It terminates at a suburbab station, that even though has trains running through bound for the main stations, they don't stop! There was a bus to catch from outside, to the city centre. It goes from Dora station (the terminus) to Porta Susa station, then on a loop round the city centre past Porta Nuova station (the main station), back past Porta Susa to Dora again. I boarded, and noted the electronic screen showing the stop names. 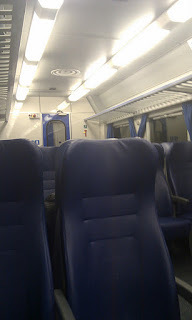 We passed Porta Susa, so I kept a lookout for the Porta Nuova station outside, and the screen, but to no avail. Traffic in Turin was terrible, no need for the "computer" device from the original Italian Job film! I then noticed Porta Susa station again, so I jumped off the bus, annoyed that I had missed the other station. There was no problem, as Milan trains stop here anyway. I bought a ticket for Milan for €10, stamped it, and walked about a km to the underground platforms. The train arrived on time, and took me to Milan Central, quite an impressive sight in its own right. I was hungry again by this time, past 10pm, and Burger King was the only open eatery in the station, so I had to eat there - of course I would have preferred a pizza, given I was in Italy! I then bought 3 transport tickets from the metro station, and went outside to find the tram to my hotel. It was easy to find, and the trams on this route seemed to be classics, worthy of any museum. My hotel, Mayorca, was pleasant enough, and booked through hotels.com was very cheap compared to the rack rate. I slept ok, but the bed was a bit hard. The following morning I had arranged to meet a former colleague who left the IT industry to return to his native Milan to become a professional photographer. I took an even older tram back to the city centre, and managed to squeeze myself and pack onto a metro for the short trip to the cathedral, where we met, walked around in the rain for a few minutes before deciding to find a cafe to sit in the warm and have some breakfast. Despite being very expensive, I do love Italian hot chocolate from cafes - thick and sweet, it tastes like they have just got a bar of chocolate, melted it, and put it in a cup. Corso Vittorio Emanuelle covered shopping arcade, taken from the same spot looking left. It was soon time to say goodbye and head for the airport. Fabrizio told me that instead of the express bus, there was also a regular bus that only took a few minutes more, and used the regular bus ticket, so we found the stop and I boarded. A few minutes later it left, but was soon stuck in traffic, as it had gone in a tram and bus lane separated from the rest of the traffic, but a tram had broken down ahead, blocking the route. Eventually the driver managed to reverse his bendy bus enough to go around the kerb and fencing and use the regular road. Before long we had pulled up in front of Linate airport. I found the LH desk and checked in my baggage, after sealing the zips with cable ties. 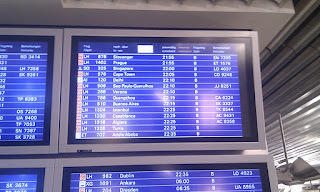 It was checked all the way to Johannesburg, however I only received my boarding pass to Frankfurt (déjà vu!). 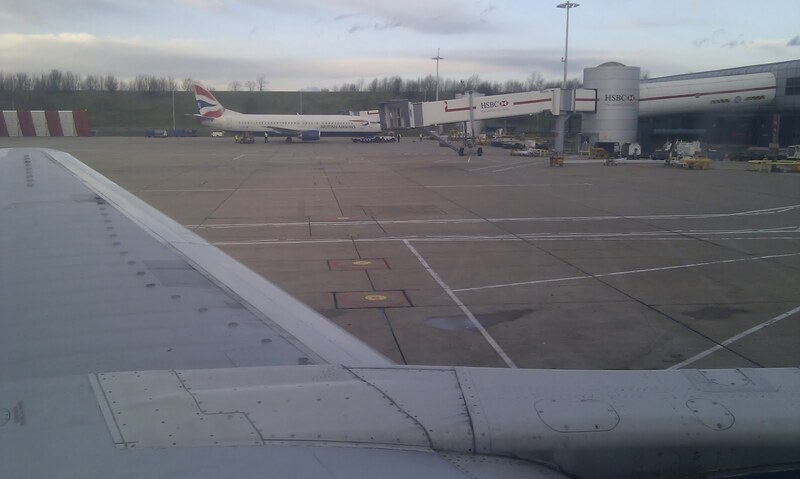 Security was quick, and I easily found the gate, currently occupied by an SAS 737. There was later a gate change, we were moved to the gate occupied by the Meridiana Airbus to the left. Plenty of AZ, and a U2. Note the greyed out tail. 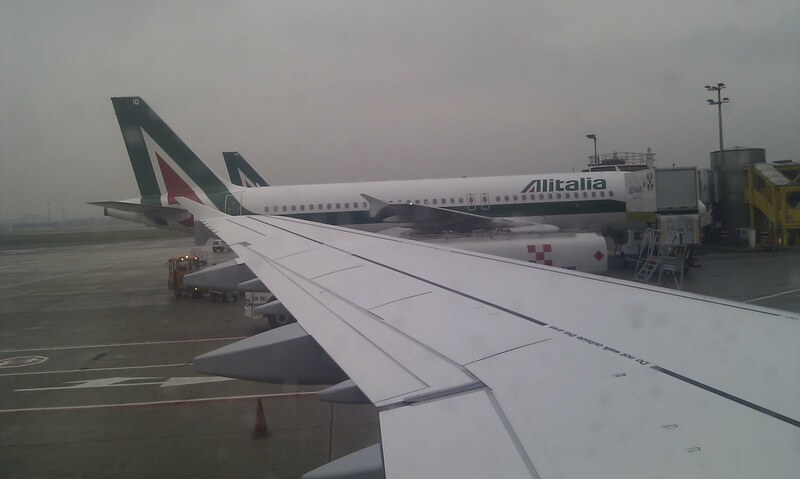 Our A321 arrived and on stand, the Meridiana (to Bari I think) flight taking off behind. 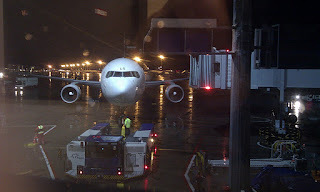 Eventually our aircraft arrived, docked, and we could board. 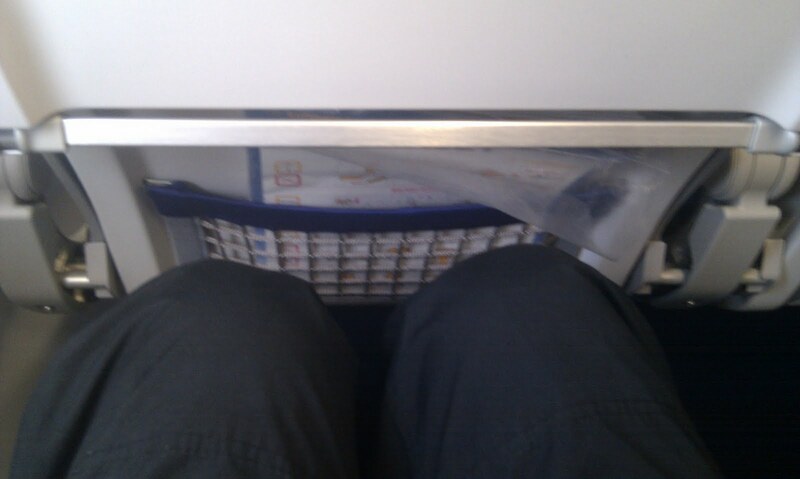 It seemed that 2/3 of the aircraft was the Business cabin. Still, the crew was professional, and everyone was soon seated. Load was probably around 60%, the middle seat next to me was empty. We pushed back and were racing to the end of the runway parrallel to a BA Airbus, that cut in front of us making the LH pilot brake quite sharply (had we been on the road, we would have right of way). Still, takeoff was powerfull, and the crew sprang into their duties. There were plenty of clouds south of the Alps, but over the mountains it was possible to see the snow-covered peaks and valleys in gaps. The service started with the crew handing out a cheese-covered croissant. I was hoping for something a bit more substantial, a sandwich for example, but it seems that LH's catering is a bit hit and miss. No drink was offered at this point - once everyone had their food, then drinks were offered. I had finished my food (despite waiting a while) before I received my drink. Somewhere down there to the left, behind us, is Stuttgart. The captain announced descent, and that we would have to hold for a while due to traffic. By this time the clouds had half cleared, and we were circling a wooded, hilly area to the south of FRA. As I was looking out of the window, all of a sudden there was a bright blinding flash, and a buzzing noise that lasted maybe a second. My first thought was that the pilot had turned on the flashing landing light, but the purser soon came on the tannoy to say (in German first, then English) "Ladies and Gentlemen, we have just been struck by lightning. Once we have further information from the captain, we will inform you." I wasn't too bothered, as I had read that modern aircraft are designed as a Faraday cage, and that in fact the average individual aircraft is struck once per year. After that we came in to land straight away, to the sight of four fire engines with flashing blue lights waiting for us at the end of the runway. 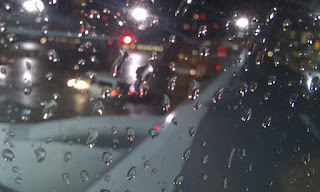 We taxied to a remote stand, and were bussed to the terminal. 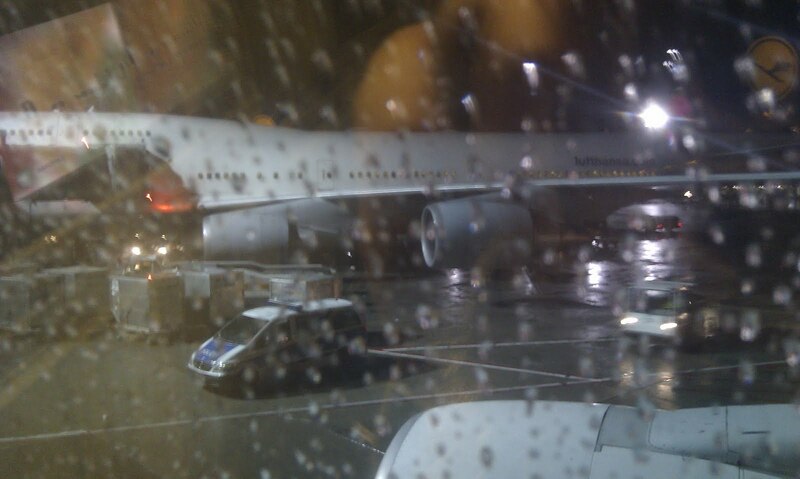 Now I had plenty of time in FRA. It was currently about 15.00, and my next flight departed at 22.30, so I had 7 1/2 hours to kill. First up was using the 30 minutes free wifi to try to check in for my Ethiopian flight, to confirm my seats, but their website was not optimised for mobile devices, so that failed :( Then I took the little train over to Terminal 2 to see the viewing gallery, which unfortunately was closed for the winter :( I didn't feel like any McDonalds, and in any case all the tables by the windows were taken. 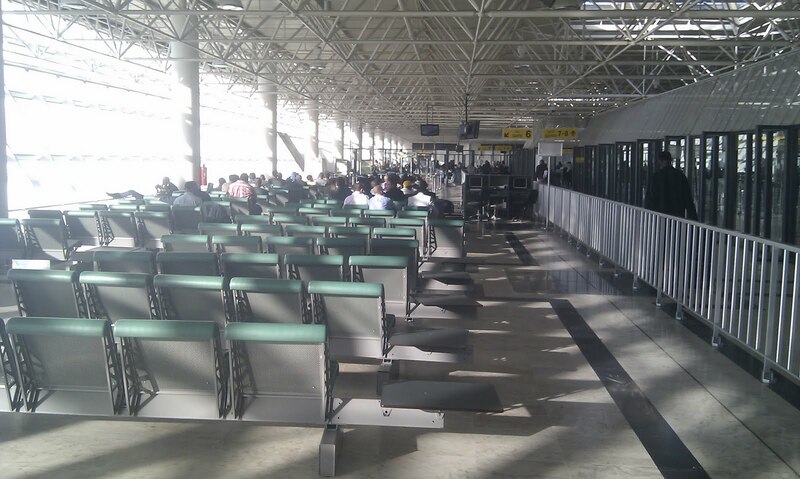 I found the AF ticket desk, and asked to reserve the bassinet seats for our return from JNB with the children 2 weeks later - the kind agent put the request in the system but said it could not be confirmed yet, and to phone the next day (I never did, but the request was granted anyway, thanks AF). I headed back to the airport after buying an Asian stirfry meal from a fast food outlet on the station, and handed my day-ticket to the first person I saw trying to make head or tail of the ticket machine. I went and had a look at the long-distance station, and bought some gluten free biscuits and crackers from a small supermarket above the station. By this time it was probably almost time to check in. The queue at the ET desk was quite long, with most people carrying large amounts of luggage, and no end of queue jumping. It seemed that most people were travelling in large family groups, and only one person queuing with about 4 trolley loads of luggage. When I reached the desk, the agent was surprised I had nothing to check in - "Mein Gepäck wird schön in Mailand eingecheckt! Die andere Leute haben viel Gepäck..." he smiled and handed me the remaining boarding passes to JNB. With nothing left to do, I went through security, where I was handed a fake EUR2 coin by the passenger check agent, to use like a voucher in the duty free store. I looked around it, and used it towards some chocolates, and a 500ml carton of mineral water that cost EUR1 - undercutting every other outlet in the terminal. Though it wasn't chilled, I was pleased to be able to rehydrate cheaply. I found a seat near another gate, sat down and read some of my Kindle book ("When I walk I bounce", by Mark Moxon, only GBP0.86, about his long distance trek from Lands End to John O'Groats). 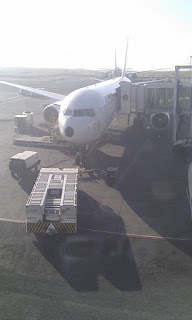 When I glanced up, my head was about 2m from the nose of an Air India 777! I didn't realise it would pull quite so close to the window. After a while I went to my gate, in a busy area at the end of the pier with LH 744s bound for Cape Town and Buenos Aires next to my lowly 767. Boarding was by row, and the agents were strictly enforcing this. Eventually I made my way on board this full flight. 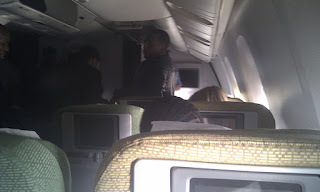 The African girl sitting next to me didn't say much, she was travelling with the 2 people in the row in front. Takeoff was from the one perpendicular runway to the others at FRA, from where we followed a lazy curve round to head south. It wasn't long before the meal service started, the options were "chicken or noodles", I chose the noodles to be a bit different, only it turned out to be pasta with tomato and cheese. Not bad for airline pasta but not what I would call noodles :) Served with a salad, bread, soft cheese and a carrot or nut cake, I couldn't tell which. I had Sprite to drink. 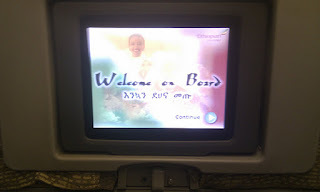 I had a look at the IFE, couldn't really - it was switched off. As it was a night flight anyway I wasn't bothered. A duty free run was offered. Despite the catalogue saying that Visa and Mastercard were accepted, the stewardess replied "No" when I asked to pay by card for a carton of cigarettes. I left it for the next leg, in case that aircraft had a card payment machine. I then tried to sleep, not easy in a Y seat! After only about 3 to 4 hours, the lights were raised, and breakfast handed out - drinks and a small muffin. Landing we had a good view of the approach, you could see farmland and small villages in between the mountains. We touched down more or less on time and docked at a jetbridge. 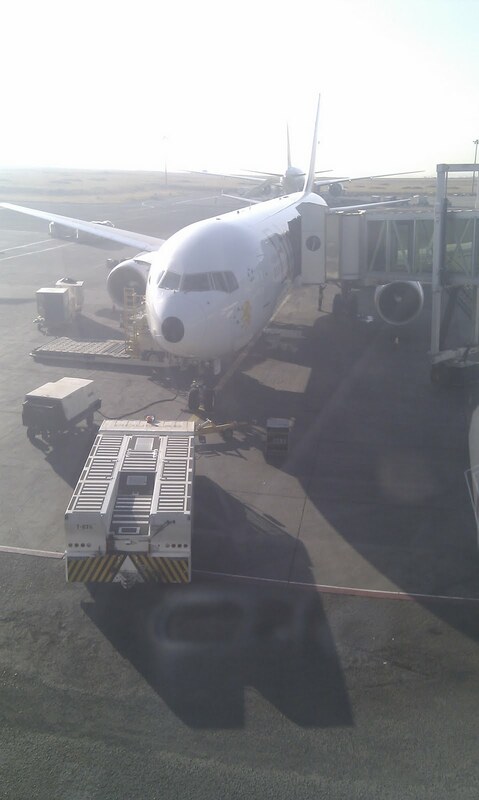 On disembarking, there was an agent at the door asking if were were terminating or connecting - remembering my earlier connection here in ADD I said "connecting to Johannesburg", and was directed up the jetbridge straight into the seating area for departing passengers, thereby bypassing the security check. Could it be they trust FRA security more than JNB security? Or just that the agent on duty then felt it easier to do it this way? Fortunately I didn't need the bathroom, or want to visit the duty free shop! 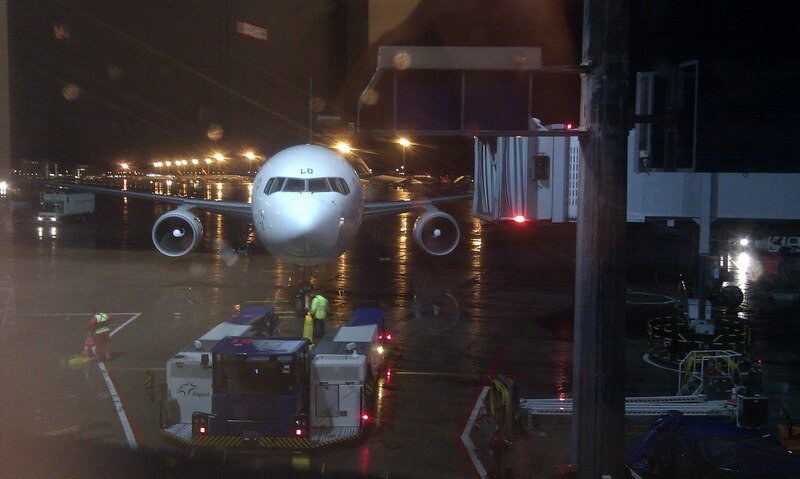 Our arrival, I hadn't noticed before that it was the Star Alliance logojet. 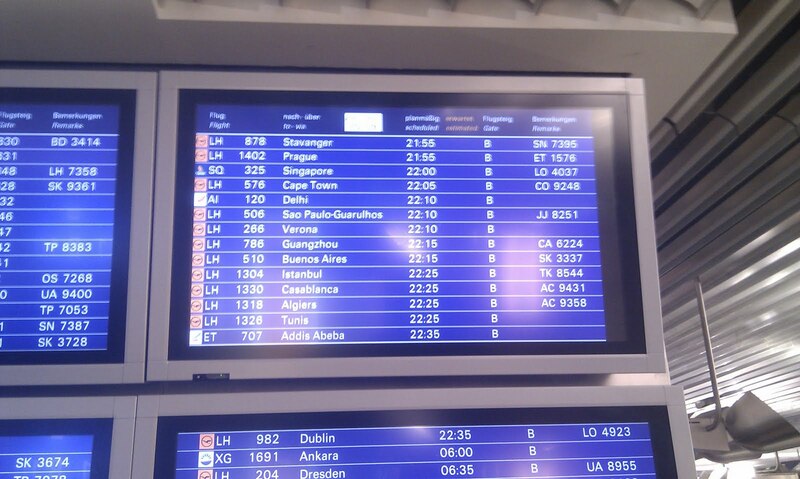 I only had an hour and a half between arrival and departure, and boarding started about 40 minutes after arriving. This time there was no pre-boarding, or boarding by row numbers. It was very orderly though. Once I found my seat, I discovered every A.netter's worst nightmare - a window seat with no window! Damn! 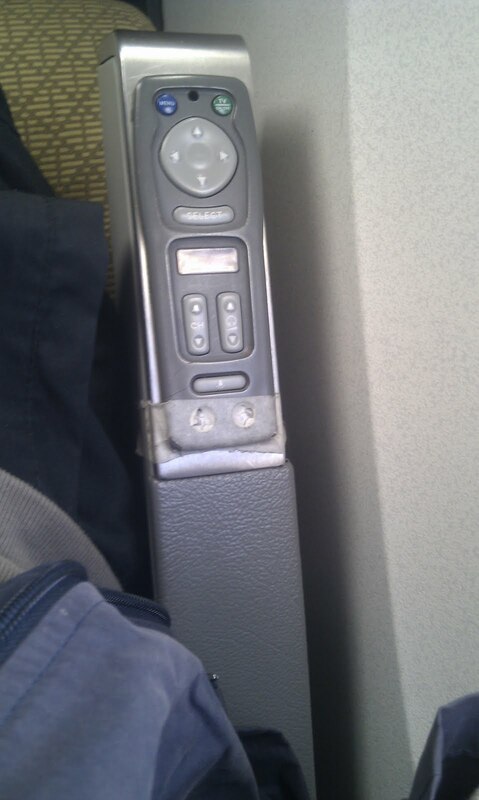 Added to that, there was no personal IFE on this aircraft. Still, my seatmate was an interesting character, and we chatted for most of the flight. She was a diplomat for the Namibian government in their embassy in India. Her husband worked in Windhoek, but was trying to find a job in Dubai, as it is only 2 hours flight from Dehli, rather than the 12 hours currently. After a couple of hours, the meal service started. You may have noticed a pattern in ET's Y class meals! This time the options were chicken, beef or fish - I went for the fish option. It was a large piece of white fish in a cheese sauce, with pasta, peas and carrots, and tasted good. Following this, a duty free run was performed, again the crew could not accept payment by card, but would accept GBP in cash. A carton of Marlboro Lights was USD13, they accepted also Euro, GBP and rands. At GBP9, I handed over a £10 note, but as they didn't have change, I said they could keep it. Whilst I don't smoke, I have colleagues who do, and would appreciate the cigarettes. 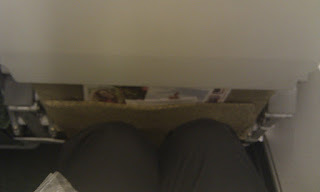 Because of the lack of window, I couldn't see out, but entertainment was provided by an older lady standing in the galley near the toilet, slowly getting drunk, clearly trying to seduce a younger man, who had the appearance of a sports and fitness enthusiast. It was quite amusing to watch, him reject her advances, but still they kept chatting. Landing was largely uneventful, and I went to baggage reclaim to collect my rucksack. After waiting ages for it to arrive, with nothing more coming out onto the carousel (which had stopped), myself and about 4 others went to report the lost luggage. It probably hadn't made the short-ish connection in ADD. At least the agent said it would be couriered down to Durban for me when it showed up. On the form I put my wife's temporary South African mobile number, as I couldn't remember my own, and my phone was almost out of battery anyway. I thanked him, and went to check in for my domestic leg down to DUR. I had chosen to fly Mango for one main reason. They offer a "Mango Plus" ticket which (at the time of booking) was an additional R150 (GBP11), that included a flexible ticket, so if my incoming flight was delayed I could change to the next flight for no additional charge. Added bonus to this ticket was lounge access, 30kg of luggage allowance (instead of 20kg) and R50 (GBP4.50) to spend on the BOB menu onboard. The checkin queue was quite long so I used one of the machines to check in, with no luggage. I then proceeded through security, and found the Bidvest Lounge, downstairs by the bus gates. I grabbed a couple of sandwiches and a coke from the buffet, and tried to find a seat by a power socket to charge my phones - not easy as the lounge was heaving with passengers, many of whom were paying cash at the entrance. I plugged my 2 phones in (one with SA SIM card, the other with my UK SIM), and noticed a text from my mum, asking how I was, if my flight had landed yet, and saying that my sister had been in a car crash that morning. What?! I immediately phoned her to ask if she was ok. My mum said she was fine, shaken up but ok, an elderly driver had gone through a red light and hit the side of her car. The car was in the garage and likely the be for a few weeks, the other driver had admitted full responsibility and declared he would never drive again, but at least my sister was unhurt. Then I had a call from my wife, saying that they had found my lost luggage. It was in Johannesburg, over in international arrivals, and that I could go and get it. Now I only had an hour or so before departure of my next flight, so I wolfed down the sandwiches and drink, got permission from the receptionist to re-enter a few minutes later, and went back to the security. I asked to go back to landside, so resolve a lost luggage issue - this was no problem, so I ran to where I had been directed by my wife, the Menzies luggage office. I was told to go through a small passage to a security check, where I explained my predicament again, and was allowed to pass through after x-raying my hand luggage and going through the metal detector again. 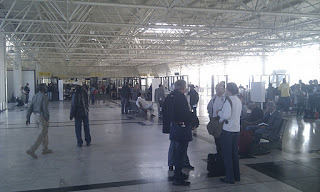 I was then back in the international arrivals baggage hall. I went to the lost luggage office, where I saw my bag! I thanked the agent for finding it, and allowing me to come and get it, loaded it onto a trolley and ran. 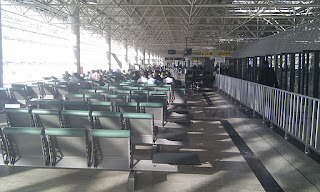 Back to the Mango checkin desks (I seem to have a habit of running though JNB - see my first report!) where the queue was still quite long. However there was noone queueing at the Fast Bag Drop desk, so I waited there for the agent to finish dealing with the passengers they were currently helping. The people at the front of the checkin queue started forward as soon as they left, but I got to the agent first - it was the bag drop agent after all! - and again explained my predicament - I had already checked in with no luggage, but ET had found my international luggage so now I wanted it tagged to DUR as well. This was no problem, and my bag was finally on its way. I could then go back through security to domestic departures, thanking the agent for letting me back out earlier, and then back to the lounge - at 30 mins to departure, 10 mins to boarding, I wanted some more food! Another few sandwiches, pastries and a bit of salad, and some juice, and I left for the gate. 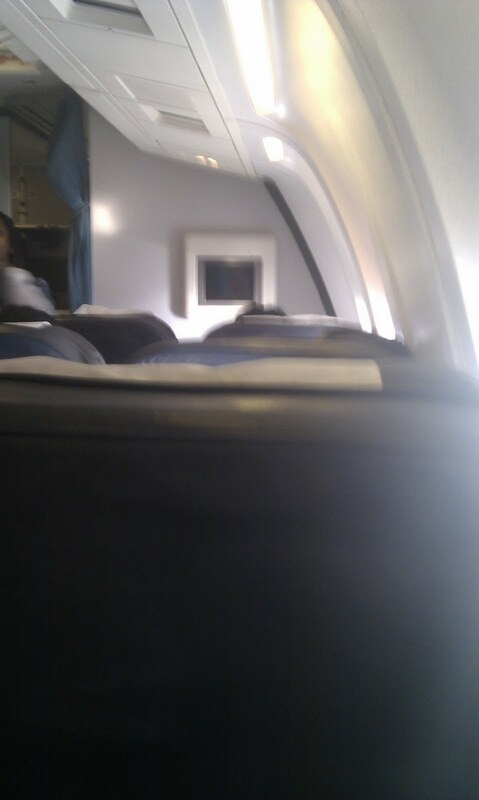 Boarding had already started, so I joined the queue and eventually boarded my first ever Mango flight. I had picked a seat roughly where I though the emergency exit would be, as they were not marked on the seat plan at the self checkin kiosk, but was 2 rows out. Never mind, but the standard legroom on Mango is appalling, really tight, at least it was a short flight of an hour or so. Then came another announcement. Apparently there were too many bags, so they all had to be unloaded and counted. I guessed this was due to my late additional bag, but I kept my head down. I did hear someone on the phone telling his friend that the plane was too heavy, but that can't be right - full 737s fly from here all over Africa, including Nairobi which route I used last year, so a short hop to DUR with a fraction of the fuel on board is not going to affect the weight that much. 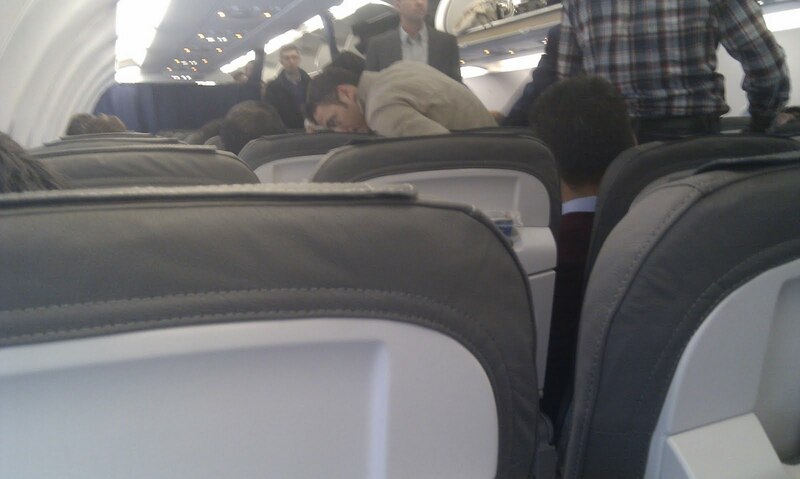 Anyway, after about half an hour the captain came back on the tannoy saying we were good to go. A quick taxi and we took off to the north, and circled round to head south-east to Durban. Sandwiches, coke, chips and nuts. Notice also the advert printed on the tray table. I had to wolf down the food, as as soon as our row was served, descent started and the crew started collecting the rubbish. I had to keep the nuts for later. After a smooth flight (a rarity on JNB-DUR apparently) we popped through the clouds and landed in a southerly direction, which meant a short taxi to stand. I disembarked with everyone else, picked up my bag (it had made it after all!) and exited to find my wife and children waiting for me in arrivals. After a month of being apart, it was great to be back together again.